7 Days: Manifesting the Life You Want is on the cutting edge of how we can acquire what we desire by applying simple principles for self-improvement. This powerful guide provides examples of how the method has worked for others. The 7 Days samples of manifestation and supportive quotes bring a classroom to your fingertips. The 7 Days website offers even more support with a blog, store, and options… for personal mentoring sessions. 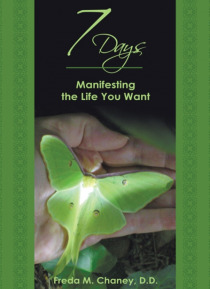 7 Days: Manifesting the Life You Want is THE book on manifestation that gets you manifesting quickly and easily. Visit the website at http://www.7daysmanifestingthelifeyouwant.com/. Happy manifesting! Other ebooks releases by Freda M. Chaney D.D.